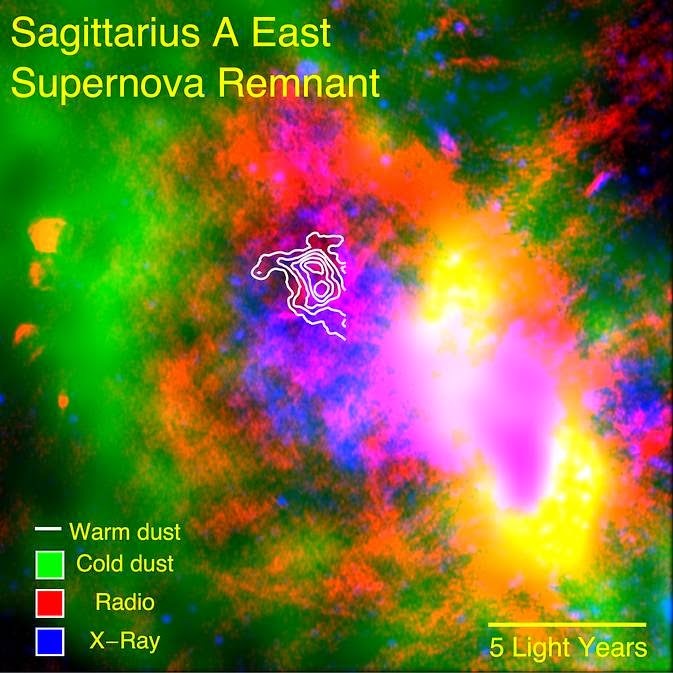 SOFIA data reveal warm dust (white) surviving inside a supernova remnant. The SNR Sgr A East cloud is traced in X-rays (blue). Radio emission (red) shows expanding shock waves colliding with surrounding interstellar clouds (green). Washington: Using NASA's Stratospheric Observatory for Infrared Astronomy (SOFIA), an international scientific team discovered that supernovae are capable of producing a substantial amount of the material from which planets like Earth can form. The research team, headed by Lau, used SOFIA's airborne telescope and the Faint Object InfraRed Camera for the SOFIA Telescope, FORCAST, to take detailed infrared images of an interstellar dust cloud known as Supernova Remnant Sagittarius A East, or SNR Sgr A East. The team used SOFIA data to estimate the total mass of dust in the cloud from the intensity of its emission. The investigation required measurements at long infrared wavelengths in order to peer through intervening interstellar clouds and detect the radiation emitted by the supernova dust. Astronomers already had evidence that a supernova’s outward-moving shock wave can produce significant amounts of dust. Until now, a key question was whether the new soot- and sand-like dust particles would survive the subsequent inward “rebound” shock wave generated when the first, outward-moving shock wave collides with surrounding interstellar gas and dust. "The dust survived the later onslaught of shock waves from the supernova explosion, and is now flowing into the interstellar medium where it can become part of the 'seed material' for new stars and planets," Lau explained. These results also reveal the possibility that the vast amount of dust observed in distant young galaxies may have been made by supernova explosions of early massive stars, as no other known mechanism could have produced nearly as much dust. "This discovery is a special feather in the cap for SOFIA, demonstrating how observations made within our own Milky Way galaxy can bear directly on our understanding of the evolution of galaxies billions of light years away," said Pamela Marcum, a SOFIA project scientist at Ames Research Center in Moffett Field, California.